Directions: Click on images to enlarge them. 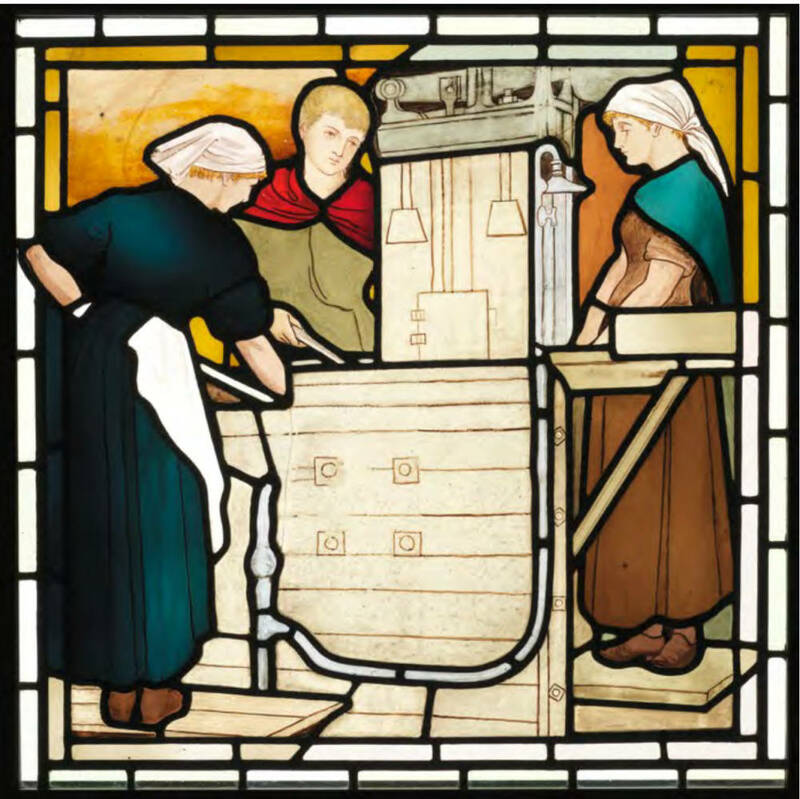 (This essay is a slightly amended version of Ian R Mitchell’s chapter The Maryhill Panels: Stephen Adam’s Stained Glass Workers, from his book A Glasgow Mosaic, Explorations around the City’s Urban Icons (2013). — Lionel Gossman, M. Taylor Pyne Professor Emeritus of Romance Languages, Princeton University. he stained glass revival in the Victorian period was to a great extent religiously inspired and went alongside the religious revival then occurring, as the Victorian bourgeoisie sought to re-Christianise what they saw as an increasingly secular working class. And no other Victorian city embraced stained glass as did Glasgow. Michael Donnelly points this out in his fine work Scotland’s Stained Glass (1997), where he describes Glasgow as the "Second City of Empire and First City of Glass." The demand for stained glass at that time was almost insatiable. Once Presbyterian opposition to the art form was overcome, the church building programmes of the Free Kirk and the Kirk of Scotland after the Disruption of 1843 created much custom. 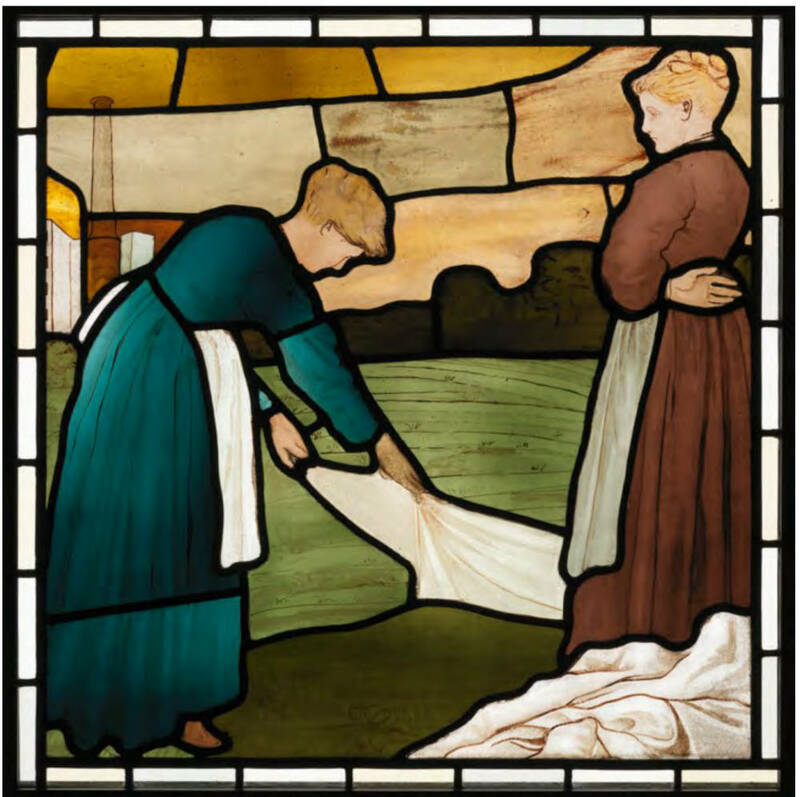 As time passed, Victorian public buildings, like courts and town halls, were incomplete without stained glass, and increasingly the rich owners of urban villas commissioned bespoke panels as features for their dwellings. 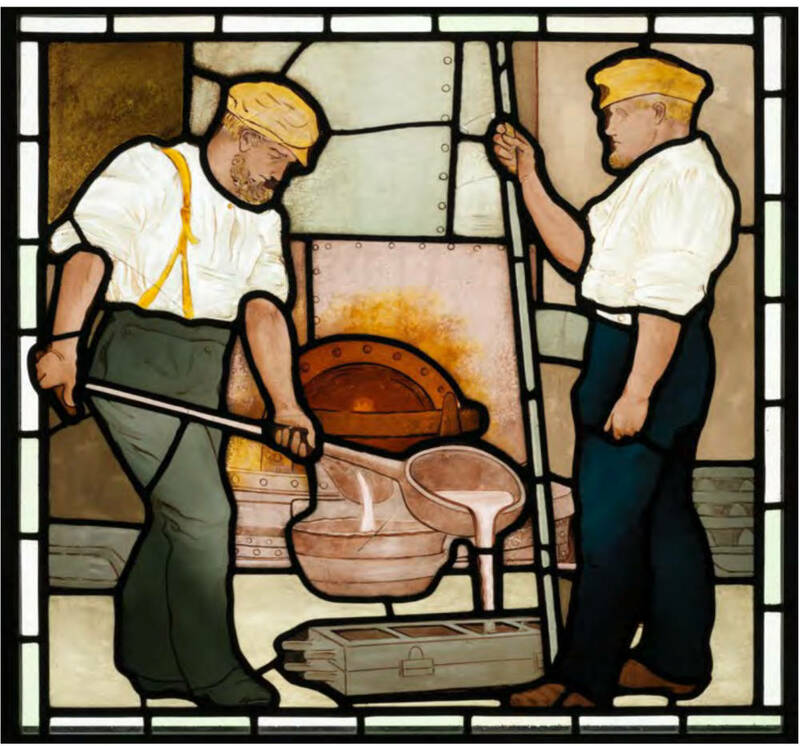 It would be rather churlish to complain that stained glass artists ignored the theme of industrial labour for that of religion, when church commissions were after all their main bread and butter. And whilst the Victorian stained glass artists’ religious work does on occasion show fishermen or other workers, these are generally clothed in biblical styles. 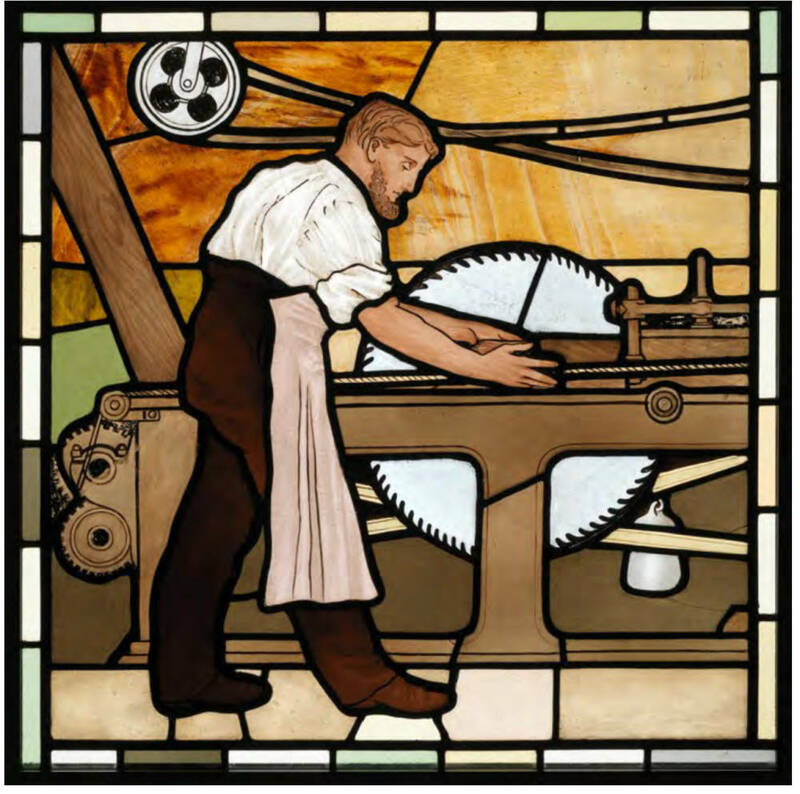 (Interestingly and by contrast however, in the medieval period, stained glass artists were bolder, often showing their workers in then-contemporary clothing, with then-contemporary machinery). However there is an exception to this rule. This is Stephen Adam’s Stained Glass Workers, the twenty stained such panels which this artist executed for Maryhill Burgh Halls in 1878. These panels show the trades of Maryhill, then an independent burgh, now part of Glasgow, and were based on intensive studies of working men and women in their industrial situations, showing in great detail their machinery, production techniques, tools and clothing-even down to a patch on one knee of a workman’s pair of trousers. Executed with great sympathy as well as accuracy, Stephen Adam’s Maryhill panels possibly stand as the largest and most realistic collection of portraits of labour in public, and possibly private, art in two centuries, anywhere. This, apart from their intrinsic artistic merit, makes them of world-historic importance. Stephen Adam. Cleopatra. The Knowe, Pollokshields. Interestingly, Stephen Adam was not a Glasgwegian, though he carried on his business in the city. He was born near Edinburgh in 1847, and at Canonmills School where he studied, Robert Louis Stevenson was a classmate. In 1862 Adam was apprenticed to James Ballantine of Edinburgh, at that time Scotland’s leading firm working in stained glass, and the one heading the revival in the craft after centuries of Presbyterian disapproval. Adam later attended Glasgow School of Art (then called the Haldane Academy) in 1865 and was awarded a silver medal for the best stained glass panel that year. In the later 1860s he was working with Alexander "Greek" Thomson on stained glass for Holmwood House (now owned by the National Trust for Scotland) and Queen’s Park Church, both in Glasgow. This connection survived Thomson’s death and in 1890 Adam produced a Cleopatra door panel for the Thomson-designed Pollokshields villa, The Knowe - reminding us that Thomson was as much Egyptian as Greek. 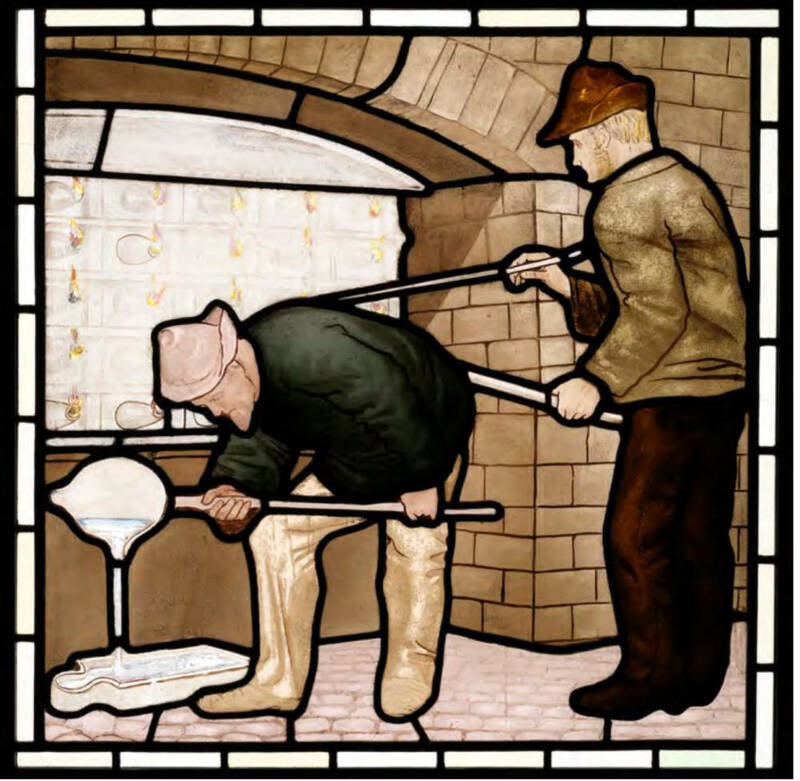 In the last quarter of the nineteenth century Glasgow was the main centre of stained glass production in Scotland, and possibly the leading one in the entire UK. There were thirty separate stained glass workshops in the city employing several hundred craftsmen as well as over 100 designers. Adam set up his own stained glass firm in 1870, and after a couple of previous partnerships (one such partnership with the renowned painter of Glasgow scenes, David Small was contemporaneous with the Burgh Hall commission, and Small may well have had a role in the design and execution of the Maryhill panels, one of which is inscribed Adam & Small) he was joined in the firm by his son, and the company produced possibly the best stained glass in Scotland for the next four decades, till Stephen Adam’s Sr.’s death in 1910. The artist’s studio was originally in St Vincent Street, later moving to Bath Street, and Adam himself lived at West George Street, at the heart of the vibrant Glasgow artistic scene of those years, described in another chapter of this work. “And these deformities are manufactured and catalogued principally in London; and the country is overrun with stock saints and evangelists of all sizes, at per foot prices.” For much of the rest of his career his bread and butter was church windows, with the obligatory "stock saints and evangelists." Pollokshields Parish Church, Bearsden New Kilpatrick Church and many others saw his talents displayed. In addition his firm placed work in mansions such as that of the threadmaster Thomas Coats of Ferguslie, and of the ironmaster Walter Macfarlan, at 22 Park Circus, and in the head offices of the Clyde Navigation Trust () on the Broomielaw. We cannot deal with these above-mentioned works here. Instead we will look in detail at the panels produced for Maryhill. These works are astounding, and would at first sight – despite sharing some of the Pre-Raphaeilite touches of the artistic period- fit more into the Socialist Realist school than that of the Gothic Revival, are more like the Stakhanovites of Soviet Russian art, than the stained glass saints beloved of Victorian Scotland. 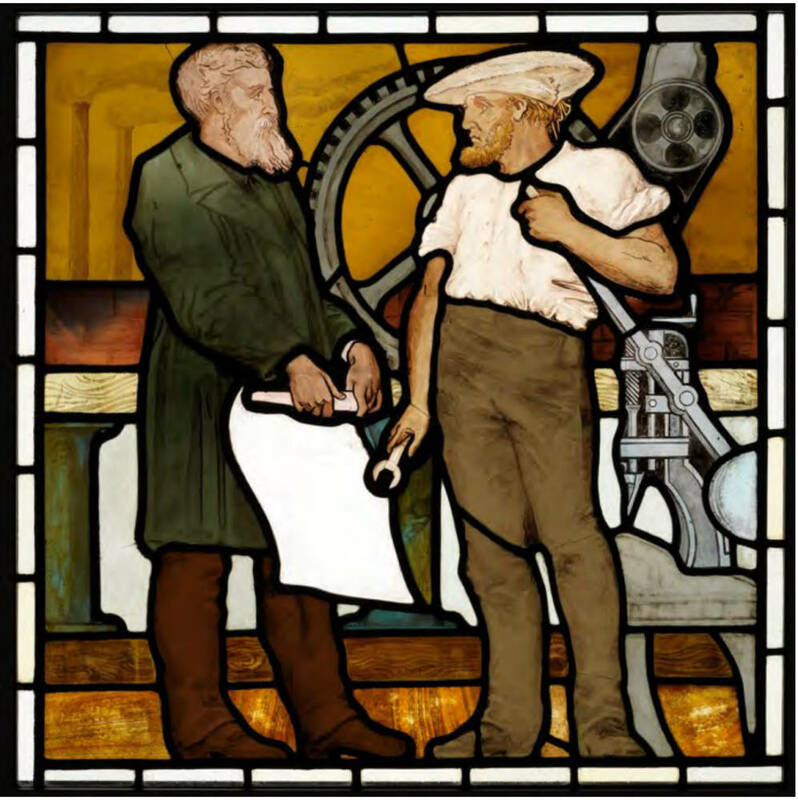 Sympathetic portrayals of The Glassworker, The Boat Builder, The Chemical Worker, The Sawmill Worker and many others graced the windows of Maryhill Burgh Halls for almost a century from 1878. The Halls were closed shortly after the centenary of the annexation of Maryhill by Glasgow in 1891, but even before that the panels were considered to be in danger, and had been removed in the 1960s, being held for safe keeping firstly in the People’s Palace and then in the basement of the Burrell Collection. Adam’s panels show working men and working women dressed in working clothes, engaged in their daily occupations. Adam must have spent much time in Maryhill’s factories, as his depiction of not only the clothing of the workmen, but of their machinery and tools is immensely detailed and accurate. 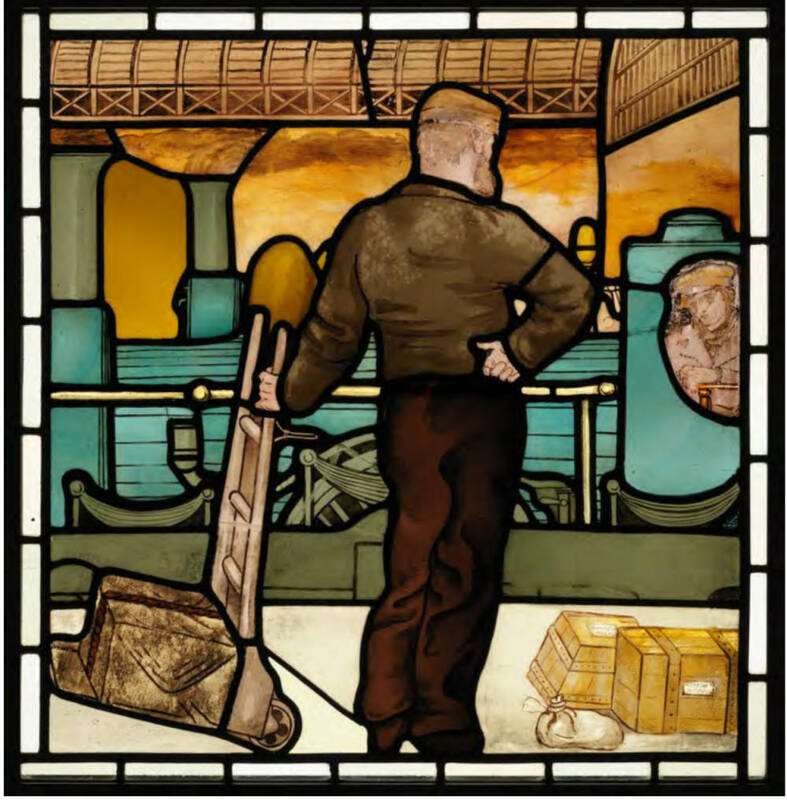 Michael Donnelly in Scotland’s Stained Glass (1997), comments of the set as a whole, “The accuracy of the detail leaves little doubt that the preliminary sketches for these panels were done in the field……Both the subject matter of the scheme and its treatment are unique.” He adds that "the kind of industrial setting" of the panels was what most artists of the time and later "avoided like the plague". Why the good burghers of Maryhill chose Adam and his industrial themes with which to decorate their Halls, we cannot be sure. The Burgh Council of the time was composed of the fairly small scale capitalists of Maryhill and it is difficult to see artistic motivation as having been their main concern. Whatever their motivation it is interesting that Adam and Small were still chasing up the council for payment of the balance of the account for the stained glass panels in 1881! Sadly, the Burgh Council records for the years 1875-1880, which might have helped us, are missing from Glasgow’s Mitchell Library. But possibly the motivation was the fact that, unlike other Glasgow industrial districts such as Govan (largely based on shipbuilding) and Springburn (overwhelmingly dominated by locomotive production), Maryhill had a varied industrial base, focussed on the Forth and Clyde canal. Its councillors might well wish to have had this reflected, indeed to have recorded the processes that took place in some of their very own workshops. The variety of Maryhill’s industries provided a fortuitous variety of subject matter for these proletarian panels, and indeed it is interesting to speculate that the local employers might have basically seen these panels as a form of advertising for their businesses, paid for out of the rates, and displayed in the most important place in the burgh. Provost Robertson opened the new Halls on 26 April 1878. A previous occupant of the burghal office was Provost Swan in 1856, Maryhill’s first, and he provides some evidence for the theory of the panels as, in part, a form of advertising. 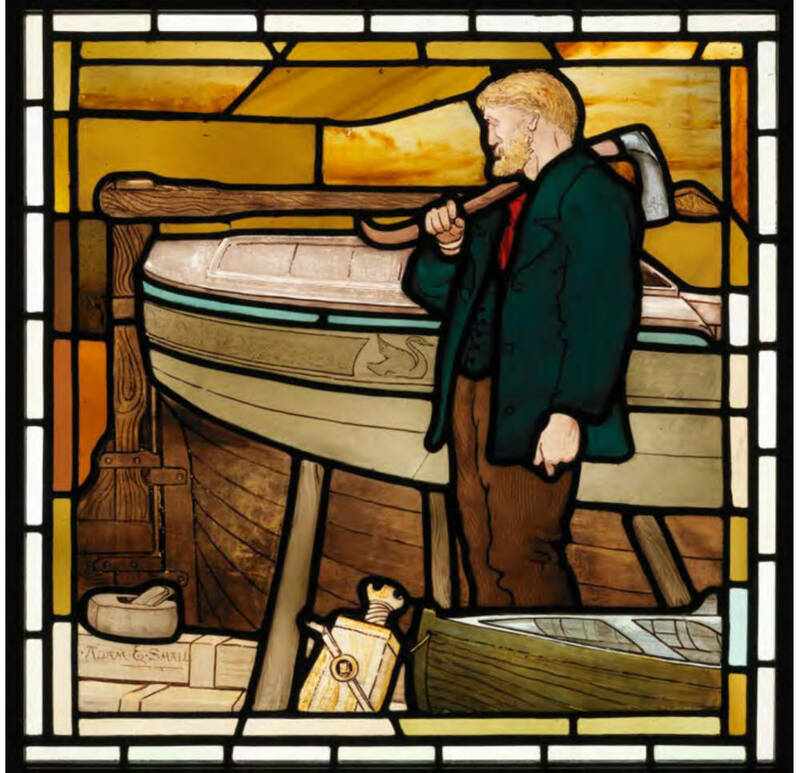 He was from the family which owned the canal boatyard at Kelvin Dock, depicted in one of the panels, The Boat Builder. The worker shown is a ship’s carpenter with his plane and shaping adze. Kelvin Dock, dating from the 1790s, was run as a boatyard by Swan & Co. in the 1850s and lasted in production until the 1920s. The boatyard built ironclad puffers, but the vessel shown is a wooden canal barge, with a swan motif. Another industrial concern was the nearby factory producing zinc, and this too was owned by Swan, and is represented in the panel, The Spelter Workers. This was a highly polluting concern and could have been one of the reasons why Swan moved from his mansion Colina, which lay near the Kelvin Dock, to suburban Maryhill Park. The brick wall of the former spelter works is still partly visible beside the Kelvin Dock. 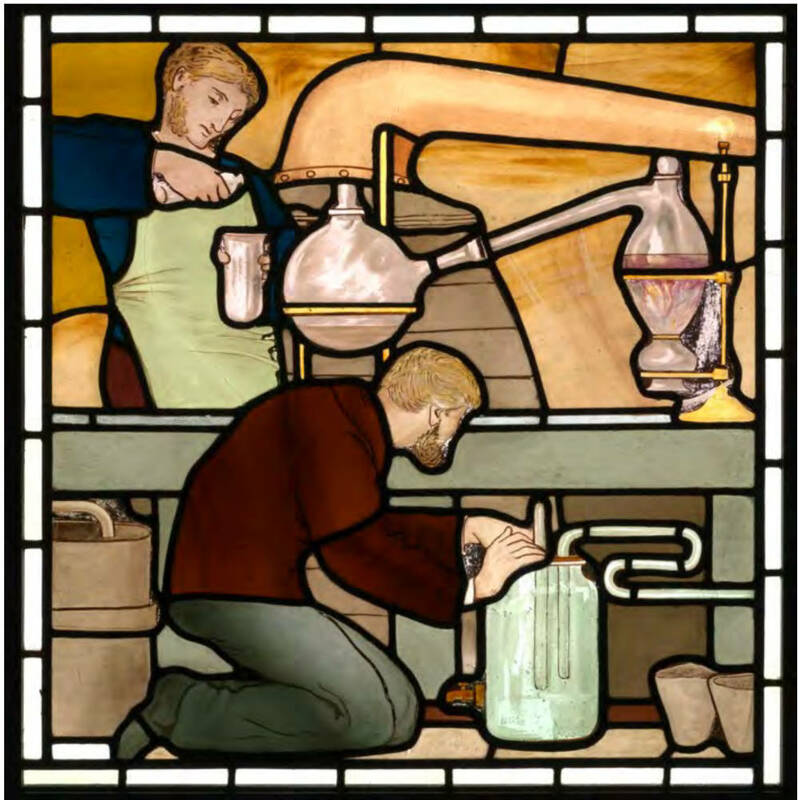 It is possible to suggest other firm locations for many of the Adams’ stained glass panels, by looking at the evidence provided by industrial archeology, notably John R. Hume’s The Industrial Archeology of Glasgow (1973), which is still extremely useful forty years after publication, and other sources such as old O.S. and other maps. For example, The Gas Worker would undoubtedly have worked in the Dawsholm Gasworks, opened in 1872 and owned by Glasgow Corporation and actually just across the River Kelvin from Maryhill and thus within Glasgow city boundaries. Glasgow’s provision of services like these was used as an argument for the city’s annexation of Maryhill in 1891. 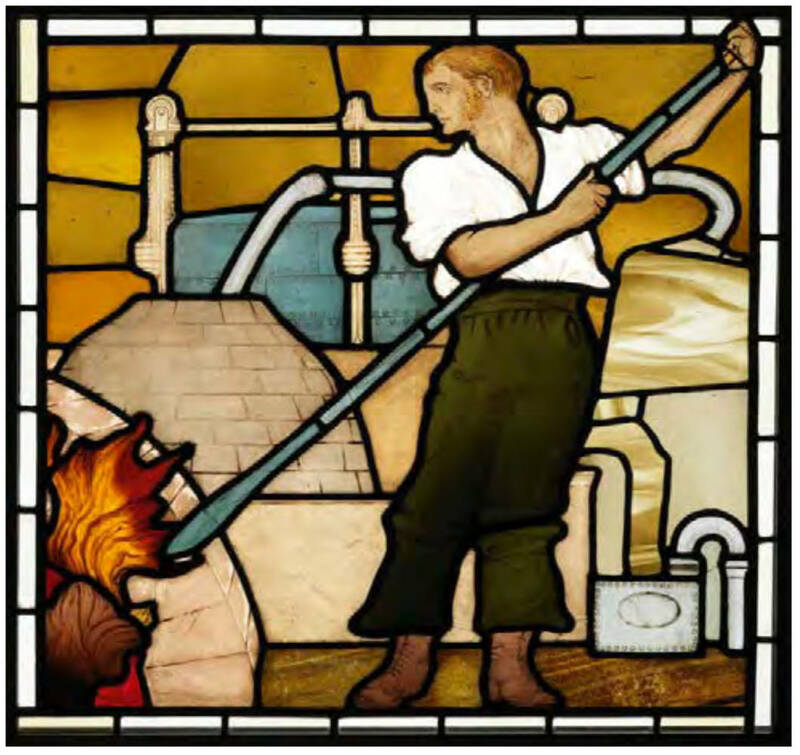 The panel not only shows the workman in his industrial clothing but also the process of production from coke oven to gas retort to storage tank, the latter detailed down to the iron rivets. The workman used as a model for this panel quite possibly took part in the gas workers’ strikes in the 1880s leading to the New Unionism amongst unskilled and semi-skilled workers of that decade. The gas works was demolished in 1968. Other panels can be similarly located. The Railwayworkers shows a station in Maryhill, which however pre-1914 had two. Which one? As Maryhill Central was not built till 1896, long after the panel was executed, this example must show Maryhill Park Station, which was built in 1856 for the Glasgow, Dumbarton and Helensburgh Railway. Closed in the 1960s, this station was reopened in the 1990s. It shows that the station was manned by a railway porter, had a covered roof (both no more) and in addition was a parcel station, with the platform littered with goods bound for various locations. The Iron Moulders can also be located fairly certainly to either the Maryhill Iron Works near Stockingfield Junction, or to Shaw and MacInnes’ ironworks at Firhill Basin on the Forth and Clyde Canal, both operating in 1878 when Adam undertook his work (Shaw was also on the burgh council, and this panel provides further evidence for what now would be called “product placement”). Other ironworks came later — and went earlier, as Shaw and MacInnes’ did not close until 2000, after over 130 years in operation. The firm originally came from, and brought their workers from, Falkirk – by barge along the canal in 1866. We see in the panel the workmens’ corduroy trousers, and the almost ubiquitous braces work at the time. We also see men pouring molten metal without any form of protective clothing, giving us an insight into safety conditions, or rather the lack of them, as that time. Maryhill had two large scale glass works, both in Murano Street, which was named after the Murano Glass works in Venice. 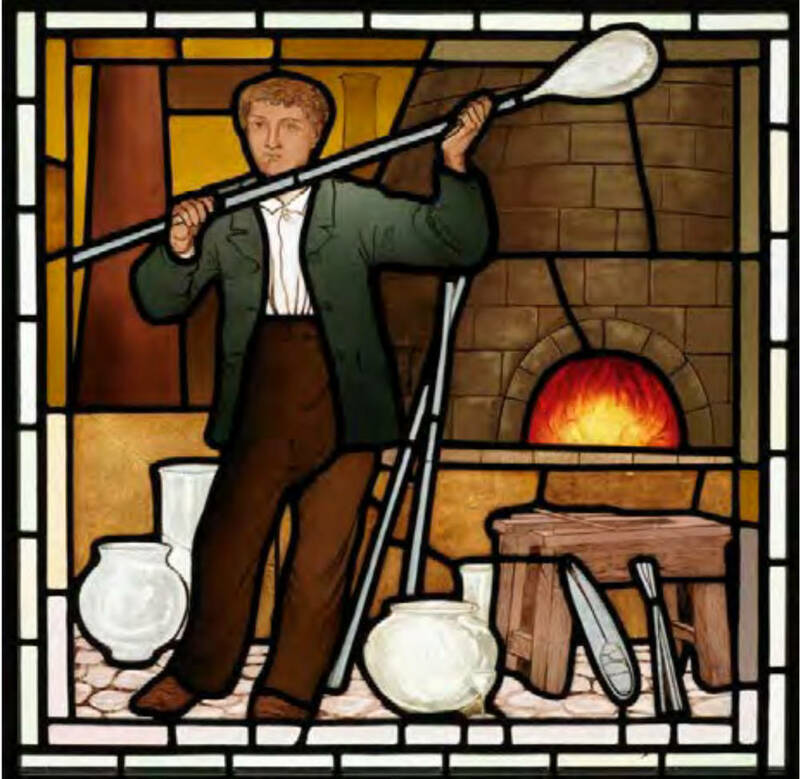 The Glassworker is shown with a wide variety of blown glass products. The Caledonia Glass Bottle Works under its owners, Gibson & Scott had been operating since 1874, and it seems likely that this is the location of the panel. The Glasgow Glass Works was also established on the canal banks in 1874, but produced rolledplate glass and is therefore unlikely to be the location. Both these works had closed by 1973. Interestingly this is one of the few (male) workers shown without a beard and the reason would appear to be that he is a mere boy. Child labour-especially in its part time work/part time schooling form was still common in the 1870s. Possibly the most interesting panels are those depicting women textile workers, The Bleachers and The Calico Printers. Maryhill in the 1870s still had a calico printworks, established back in the 1830s. Barr’s Kelvindale Works had seen a violent strike in 1834 when the factory was employed by the military and a striking workman George Millar was killed by a "nab" (scab). Millar’s fellow workmen erected a memorial to him in Maryhill Old Kirk graveyard. This industry was in decline when Adam did his panel, and the factory closed soon afterwards. Thomson’s Memories of Maryhill, dating from 1895, describes the works as having been demolished. The fact that the bleachers are whitening the cloth in sunlight (after it would have been soaked in urine) rather than using a chemical bleaching process possibly indicates- as do some of the other panels- the technologically backward nature of Maryhill’s industry at this time. On the other hand some of the woman in The Calico Printers panel have (probably self-provided) head gear, and (again probably self-provided) clogs to keep their feet dry, though the employer has provided wooden (later so-called) duck-boards to keep their feet out of the water. Though at some point erroneously labelled The Calico Printers, the women are actually not printing but possibly fulling (shrinking) or dyeing the cloth. Another panel, in poor condition, has been identified through a Victorian trade journal, as a male worker using a calico press to print the cloth, and this was most probably executed in the latter days of the Kelvindale works. Possible further evidence of technological backwardness is given in The Papermaker panel, where the machinery is clearly made out of wood, which would have been cheaper than metal. Unlike other industries which moved to the canal with steam power, the paper mills stayed on the River Kelvin, because of their need for large amounts of water. The man here is either working at the Dalsholm Paper Mills, founded by William MacArthur in 1783 on Dalsholm Road near Dalsholm Bridge, or more likely at the Kelvindale Mills further downriver at Kelvindale Road, established at about the same time as a snuff mill and later converted to paper making. This latter works’ lade and weir are still visible on the Kelvin. Dalsholm closed in the 1970s, Kelvindale had shut down earlier. For The Sawmill Worker, there are a trio of candidate locations. MacFarlane’s Ruchill Sawmills in Shuna Street was operating in 1878. The man show might be working at there, or at either the Firhill Sawmills or the Western Sawmills both of which were located at Firhill Timber Basin, a facility built with the canal but greatly extended from 1849. Ruchill Sawmills became part of Bryant and May’s match factory c. 1918, the Western Sawmills had converted to a chemical works by 1896 and the Firhill Sawmills were the last to go in 1968. More than any other panel this shows the dangerous working conditions of the time, with the workman’s loose clothing (and hair) being in danger of being drawn into unprotected parts of the machinery like the overhead drivebelts, the sawing machinery, and of course, the rotary saw blade itself. This panel illustrates many ways in which that worker could die. The Chemical Workers is another interesting panel. The workers appear to be engaged in some kind of distillation process. Of the various chemically related industries in Maryhill, several would have been operative when Adam did this panel. But the most likely candidate is the Glasgow Lead and Colour Works of Alexander Fergusson which dates from 1874 and was on both sides of Ruchill Street, with a wharf to the canal. The point made about safety-or lack of it- is again evident here, as the workers wear neither hand nor, more vitally, eye protection. Maryhill was not strong on engineering. The almost certain source of The Engineers would have been the Maryhill Engine Works at Lochburn Road, built in 1873 for Clarkson Brothers, later Clarkson & Becket. Possibly one of the brothers, John or James, is explaining to the workman with the spanner the requirements of the latest job. The works produced steam engines and careful analysis of the drawing sheet indicated a small steam engine to be built probably for a canal barge. The workman is again in corduroy breeks-denim dungarees were still a decade or two away- and like many others in the panels wears not a bunnet or cloth cap, but a Tam o’ Shanter headpiece. The building which housed this factory is still standing, to my knowledge the only one so doing in the entire set of panels, and remarkably it still houses a small engineering works. This works executed the ironwork for the restoration of the railings of the former public toilet just outside the Burgh Halls. The historical information contained in these panels is both extensive and in many cases unique. How many visual examples remain one wonders, of how scaffolding was erected in the High Victorian period? The Bricklayers panel shows us a couple of fellows on a scaffold. The wooden scaffolding is show in detail, as are the wooden ladders, and most importantly, the rope knots, minutely delineated, holding the whole construction together. Most of Maryhill was built of stone - the tenements, the barracks, the churches and the civic buildings. On the other hand many of the factories beside the canal were brick built, and this is probably one of these being constructed. One could analyse every panel, but time and chapters must have a stop. The Soldiers reminds us that Maryhill was a military town. 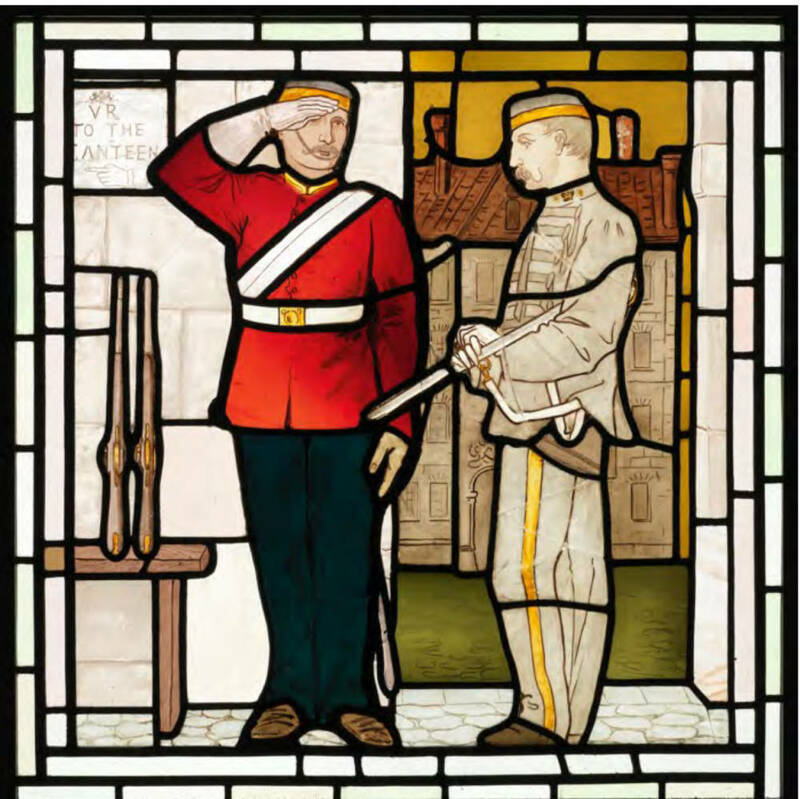 Just opened in 1876 when Adam did this panel, the Maryhill Barracks was used by various regiments until eventually becoming associated with the Highland Light Infantry or H.L.I. The building where the two sodjers are shown could well be the still extant gatehouse, looking out onto the tenements on Maryhill Road (interestingly, red pan-tiled rather than grey slated at that date), or possibly inwards to the barracks themselves. Soldiers then, like policemen, all wore moustaches. This military connection ended in the early 1960s when the barracks were closed and the Wyndford housing estate built on its grounds. The wall of the barracks still stands and carries a memorial to its former history on the corner of Garrioch Road and Maryhill Road. Representations of workers by Adam also exist in the Trinity Hall, Aberdeen depicting "The Trades". However, these – stunning as they are — were executed in a different style from the Maryhill panels, and one possibly more acceptable to Victorian taste. The Trinity Hall Butcher for example is dressed in Biblical garments, and The Weaver in medieval ones. What is clear is that the Burgh Hall panels are unique and that they did not set a precedent; in bourgeois High Victorian Art industrial production is virtually invisible. Stratten’s Glasgow and its Environs (1891), a business guide to the city, mentions much of Adams’ work in the entry on his firm, but interestingly not the Maryhill commission, despite it being probably his largest single work. 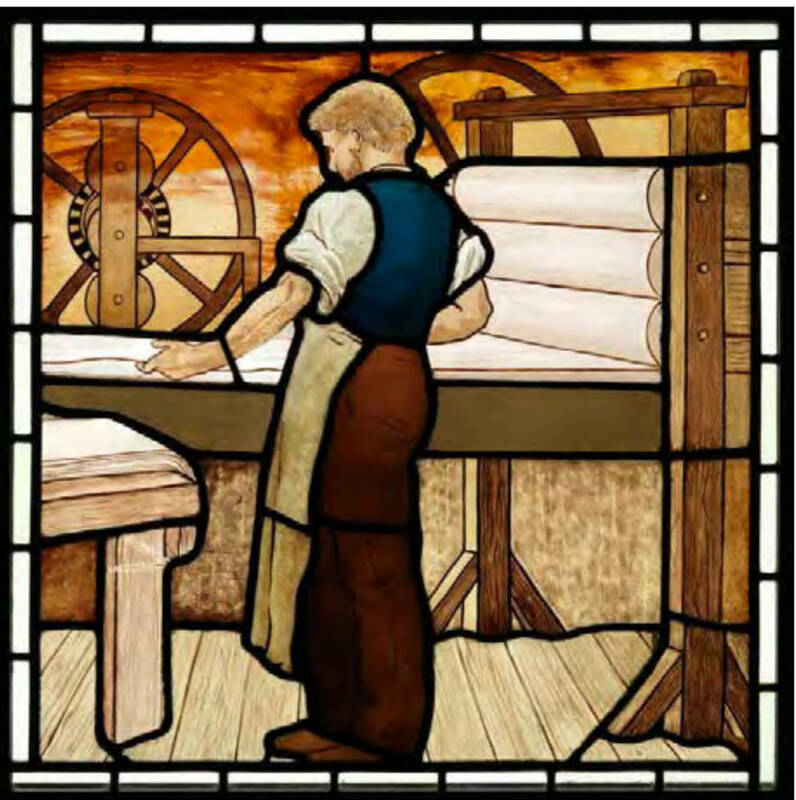 It is interesting, however, that there is no evidence that Adam was driven by socialist sympathies in his Maryhill work; the attempt to wed the arts and crafts to socialist ideas had to wait until William Morris’ influence in the 1880s. Adam appears to have been a clubbable man, giving slide lectures in the Art Gallery to the Ecclesiological Society, and being a member of both the Glasgow Philosophical Society and the Society of Literature and Arts. His photograph in the 1896 short pamphlet Truth in Decorative Art, shows him as a well dressed, if slightly bohemian, character. He would appear however to have been a not unusual Victorian paterfamilias, in that in 1904 he fell out with his son Stephen, whom he disinherited. Stephen Jr. left the firm to set up his own studio. He in turn was an associate of Charles Rennie Mackintosh, and worked on various Glasgow tearooms including Pettigrew and Stephens’ in Sauchiehall Street. He also did the stained glass windows for the Imperial Bar in Howard Street which are still in situ. When his studio was unsuccessful, Stephen Adam Jr. emigrated to the USA where he worked on film sets in Hollywood, and he died there in 1960. There have been various schemes envisaged for the regeneration of Maryhill - and of the canal itself (which has been reopened to navigation after being closed for 50 years) — which construction gave the burgh its birth. New housing has been built along the canal banks where formerly stood the workplaces Adam depicted and there are ideas about transforming the wonderful Maryhill Locks and Kelvin Dock, with its associated Kelvin Aqueduct (finished by Whitworth in 1790 and a scheduled Ancient Monument) into a focal point for leisure industries on the canal. Amongst these plans for regenerating Maryhill that for the Burgh Halls was central. The building (with associated police and fire stations, and swimming pool) had been left to decay after closure two decades ago. The restoration of the former swimming pool to its original function has been undertaken by the Glasgow City Council, and a Trust was established to raise funds for the the restoration of the Burgh Halls themselves for use for various forms of community and business purposes. After seven years of work, planning and fundraising, the Burgh Halls were re-opened in April 2012. Ten of Stephen Adam’s stained glass panels are back in the halls on public display and the other ten will be rotated with them on a semi-permament loan basis from the city council. Fifty years ago, a local Maryhill working man and political activists moved mountains to get the stained glass panels taken into the care of the People’s Palace. He was told by all and sundry “No one is interested”, but his persistence paid off. Too ill to attend the official re-opening of the Halls in 2011, Stewart Watson was taken on a personal tour of the building just weeks before his death, and was able to see the panels back in place after 50 years. A true Working Class Hero.